Spring Hofeldt's homages to the offbeat characters of the animal kingdom cast this ostrich as your loveably awkward friend or favorite social critic. Against a vivid teal backdrop, Squawk unhinges his impressive beak as if to exclaim "hey--I'm squawkin' here!" 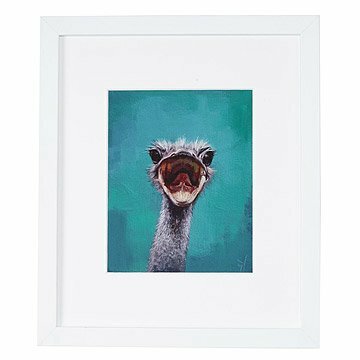 Each ostrich portrait is printed using acid-free paper and presented under an acid-free mat and Bonanza wood frame. Made in the USA. For more from this collection, meet Ned , Francine, and Otto.